Is the Ormskirk to Preston line the worst railway in the UK? 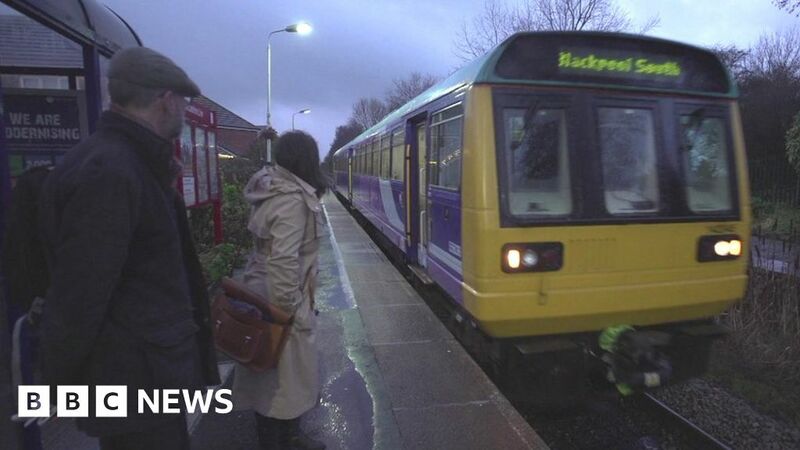 Since the timetable changes in May, more than 2,000 services have been cancelled between the two towns in north west England, a figure that rises every day. In exclusive data analysed for the BBC, 5,712 trains were timetabled to run during the six-and-a-half-month period. But up until Saturday 15 December, only 3,701 operated. That meant a third of services simply vanished. The Mayor of Greater Manchester, Andy Burnham, says the route operator, Northern, should now be put on final warning. Those living and depending on the route have had enough. Students missed end-of-year exams because the hourly train didn’t arrive. Elderly people continue to miss important hospital appointments. Some are in trouble at work. The personal toll is huge and people in this corner of the North West feel no-one really cares about them. How do the passengers feel? We spent the morning at the small station of Croston, halfway along the 16-mile route. The station has no facilities, it’s a single platform exposed to the rural elements that awaits the arrival of the Northern train service. Olive Nicholls is 23 and works in a clothes shop in Preston on an hourly contract. “The fact that I have to tell work I’m going to be late for work, or I’m not going to be able to make it that day means I’m going to lose that day,” she said. Juliet Essam uses the line every day. She says it’s been “a year of just not knowing when it is going to turn up”. Kath Almond lives in Croston. “This is the only public transport we’ve got,” she says. Kath knows one man further down the line with a learning disability who relies on the train because his electric wheelchair cannot fit in a car or taxi and there are no buses. When the service is cancelled, hour after hour, he’s left on the platform in distress. The timetable change back in May affected routes across the north, as Northern Rail and Network Rail tried to introduce more trains to the network. But they weren’t ready and the consequences were huge. Cancellations, delays, a lack of drivers and not enough carriages became the norm. Some sections of the network have slowly improved, but for others the daily gauntlet of catching the train continues. David Brown is the managing director of Northern Rail. He admits the service they have offered in parts of 2018 has not been acceptable. “Myself and team are committed to getting that right,” he says. “We’re starting to see stabilisation of the timetable and were starting to see the investments were making in new trains. We pushed Mr Brown on whether he was fit to run the franchise. “Northern are absolutely fit and I’m absolutely fit,” he said. The Mayor of Greater Manchester, Andy Burnham, doesn’t agree. “I think they should be given clear notice,” he says. Our last destination of the day was Ormskirk Station. When we arrived on the platform, it was announced the 11:01 was 15 minutes late. We guessed as much, as it was 11:03 and there was no train. Paul Dickie used to work for Northern Rail and now runs a local passenger group. For him, this is about more than trains.